Customer is using on-premise infrastructure with no automation, resulting in decrease in ROI, increase in hardware issues & couple of weeks to deploy & update application. The client faced on-premise hardware failures and deployment of application takes days or weeks to get implemented. 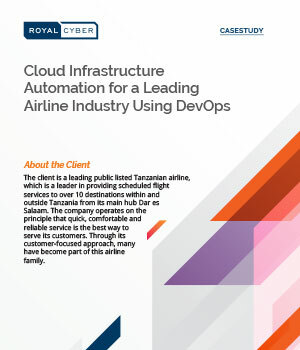 Royal Cyber moved all infrastructure to Cloud and use DevOps tools to deploy infrastructure to the cloud.